Funny how you can wear a perfume for years and not recognize a certain note until you compare it with another perfume. Such was the case when I compared Sisley’s Soir de Lune with Estée Lauder’s Knowing. I had never noticed that Knowing had a camphorous note! But, there it was when I put it up against Soir de Lune! I guess I’ll never think of (and wear) Knowing in the same way again. As for Soir de Lune, I knew I had a winner on my hands when a colleague walked into a meeting room and asked me what I was wearing. Such is Soir de Lune… an in-your-face rose chypre that one wears like my mother wore a rhinestone skin brooch which she glued directly on the skin in the 50s… for drama! That brooch with a strapless gown must have been spectacular… as is Dominique Ropion’s Soir de Lune. To say the SdL is a rose chypre is really an understatement. It is THE rose chypre of rose chypres, no doubt about it! All the elements are there in chypre-glory… oakmoss, patchouli, labdanum and what smells like one of the best rose absolutes on the market. It’s got some powder but it is not overpowering and as for longevity, my eau de parfum lasted longer than I did. The day after wearing Soir de Lune, I wore Paloma Picasso and although they share DNA, they don’t deliver the same punch. Soir de Lune is almost in a class by itself… rich, dark, mossy, forbidding and worldly! My only concern is… who is woman enough (or man enough) to wear it! All the Cates and Gwyneths rolled into one actress couldn’t wear it, I don’t care what fancy dress they’ve got on. Penelope Cruz might be able to get away with it in a few years but I’m not sure. No… I’m going to go out on a limb and say that to wear Soir de Lune, you had better know who you are and I think that Sean Connery in full Scottish regalia could wear this magnificent Scottish rose chypre magnificently. If you have the bucks, buy this one for special evenings when you wear your best dress and all the fancy jewelry you own. If you want a rose chypre that is more wearable for daytime, check out David Yurman. 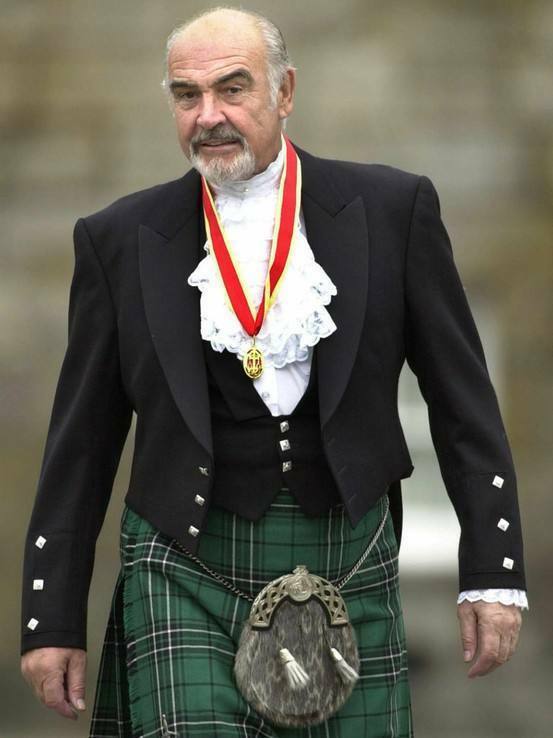 Sean Connery dressed like this could easily wear Soir de Lune.